I'm thinking of this now, not so much because I'm feeling particularly smart, but because I'm feeling genuinely gifted, but not in the old personal-ability way. This is more of a grateful acceptance kind of thing. I have a little bit of trouble accepting kindness from others. 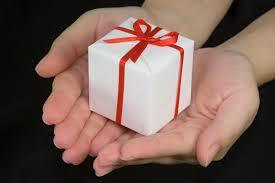 It's much more comfortable for me to give than to receive. I'm working on that, and I'm getting a lot of help with it too. Lately it seems like I'm being singled out again, and asked to go in for another test. This test is much more meaningful, and the office is not a dingy closet, but the whole wide world instead. I get it. It's true, I am gifted. Gifted to have a husband who adores me and is my absolute comrade in life, gifted to have friends who love me and aren't afraid to show it, gifted with actual tokens of their affection, many of them recently, and gifted, finally, after a lot of muddled years, to be able to open my hands, eyes, heart, and let it all in. Even in the chaos I've willingly plopped myself in the middle of, there's a growing sense of calm, and enormous gratitude for all the gifts that surround me. Gifted and Talented. Aren't we all, in some way or other? We don't need Mrs. Roof to tell us that. We just need to step outside that crummy little office, and take the time to see it for ourselves. Recognition, acceptance, and gratitude are what make it all click into place. Wow. That was really thought provoking. We are all gifted and talented. It never occurred to me that that would be a negative to a child to be so esteemed, but I get it now. No one wants to be tagged or singled out or labeled. And if we each celebrated our own unique gifts while being open to the possibilities of others' unique gifts and how we all fit together in this great big puzzle of life we might be a lot happier. Thank you for sharing your insights. You are indeed a gift. Ivan survived being gifted and talented too. Poor thing! Here's an opposite story: if you were a kid in a Nevada public school before, like, 1980 you sat there like a lump of unformed clay for 12 years. Nobody cared, with a pitiful few major (yet ultimately minor exceptions) teachers who did notice how you did, who you were, what you were capable of. For me growing up Nevada was a hostile, arid, blank DESERT in more ways than one. I literally wasted away, dying of thirst for knowledge. My Mrs. Roof moment came in 1st grade when we were still living in CA: Miss Mitchell took me to the teachers' lounge and had me sing a song in Spanish to the teachers! That is a moment I'm still proud of, and I can still roll those Rs with the best of 'em. That year of school was my only good one. The rest of it was a big bagful of Nevada ignorant sand. I would have relished the opportunity to be exposed to art and theater and poetry. To have been challenged intellectually. It never happened. So, finally at age 38 with the support of a loving husband, I did go to college and earned a masters degree. But more to the point I was exposed to art and theater and opera and philosophy FINALLY. It was wonderful! Funny how doo-doo turns out sometimes, ain't it? I have never agreed with children taking IQ tests. When my daughter was five, she could read and understand at college level. She just gets things. Teachers insisted I have her take tests so that "I could offer her what she needed". I just want her to be a child, to like what she likes, to do what pleases her heart. I want my child to be a child. I want that for both of them. I don't want them to be labeled with anything so that they understand they don't have numbers or limits attached to them.